While it might be the slowest of the Interceptors, the Taranis still enjoys a relatively good reputation as a brawler (albeit much less so than it used to). As an Interceptor is has a significant speed advantage over the slower Assault Frigates, however in exchange it's a relatively fragile ship even by T1 Frigate standards! The Enyo on the other hand is a brawling powerhouse. Naturally high resists along with good base HP make the Enyo far tougher, and its firepower makes even the Taranis' impressive damage output look weak. In exchange for this capability, the Enyo's top speed is curbed to a level below that of your average T1 Frig. Both ships have similar slot layouts (4/3/3 for the Taranis and 5/3/4 for the Enyo), with bonuses to Hybrid damage and tracking speed. The Enyo complements this with an optimal range bonus, while the Taranis gets a reduction in cap-use for propulsion jamming modules. Crucially, both ships are able to offset part of the signature radius increase caused by running a MWD, although to different degrees - the Enyo gets a fixed 50% reduction, while the Taranis receives 15% per Interceptor level for a maximum of 75%. While both ships are popular solo, we're comparing them here in their role as close range tacklers. With that in mind, our main concerns are how quickly each ship can reach its target, and how survivable they are both while chasing and while holding a target for their gang. Damage output is a nice plus, but not a priority. 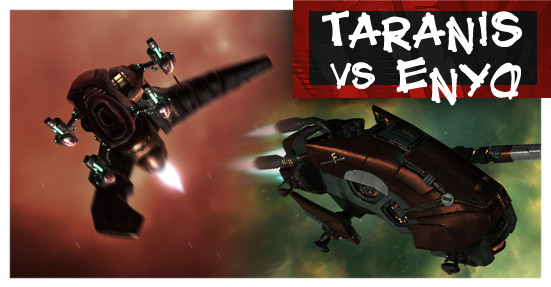 There are many ways to fit both ships; the Taranis is quite popular as a dual prop setup with minimal tank, while the Enyo is frequently fit as a high-damage brawler even when tackling is its role. However to keep things more directly comparable, I decided to fit both ships as dedicated tacklers with a focus on toughness and speed - that means shield tanks, MWDs, and overdrives/nanos in the lows. When it comes to getting around, we're clearly on Taranis' home turf. The Taranis is about 1.2km/s faster than its AF counterpart. To put that in perspective, the Taranis will take 24 seconds to cover a distance of 100km when starting at full speed, whereas the Enyo will take 34 seconds. The Taranis also sees a comfortable lead in terms of acceleration, taking almost a second less to reach its maximum speed while under MWD. 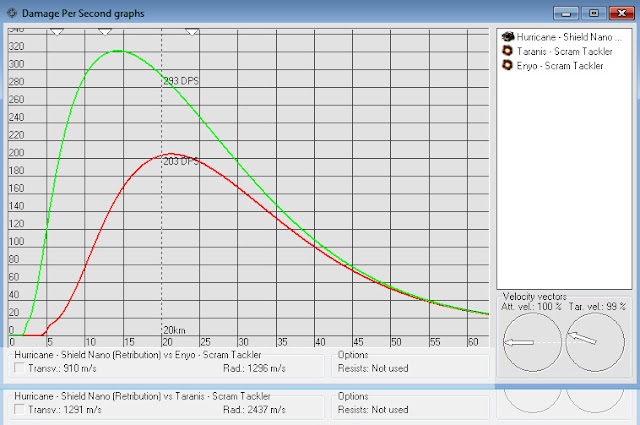 Starting from stationary (and approximating by assuming that the rate of acceleration is constant), it will take the Enyo about 10 seconds to get within scram range of a target 30km away. The Taranis will take about 7. While that might not seem like a lot, try counting out three seconds in your head next time you narrowly escape tackle. To top it off, the Taranis also warps faster - when chasing a target in a long warp, this can mean that you actually come out ahead of them, which is nice! One of the biggest roles of a scram tackler is chasing down a fast target so that slower ships in the fleet can get into range. Naturally then, this section is going to carry quite a lot of weight. Despite both ships having similar fit, the Enyo's higher base HP combined with natural resists gives it about 70% more EHP than the Taranis, which should ostensibly give it an advantage when it comes to survivability. However, the Taranis' larger signature radius reduction should help it evade a larger portion of incoming fire. The question is, how do these two factors stack up in practice? Let's revisit out example from earlier, of chasing down that target from 30km away. The graph below shows the damage per second that each ship with take from a 425mm autocannon Hurricane (loading Barrage ammo and excluding drones). Like any smart tackler should do, I've set both ships approaching at about a 15-20 degree angle rather than flying straight towards their target in order to increase their angular velocity and bring their low signature radii into play. Green is the Enyo, red is the Taranis. As you can see, the Enyo with its larger signature radius takes substantially more damage during almost the entire approach. On average between 30km and 10km, the Enyo takes 66% more damage (I'm being generous here and excluding the anything inside 10km at which point the 'Ranis is barely being hit at all). But wait! The Enyo takes 10 seconds to cover that distance whereas the Taranis takes 7! So the Enyo not only takes more damage, but it takes it for longer! Taking the average dps that each ship receives between 30 and 10km (which isn't technically right because they speed up over the first half, but let's approximate), the Enyo takes 2655 damage (19% of its total EHP), while the Taranis takes 1169 (18%). But wait! The Hurricane isn't going to sit still, it's going to fly away from them! That means the Enyo only gains on the hurricane at 1462m/s, while the Taranis' does so at 2672m/s (82% faster). Assuming the Hurricane is already burning at full speed and the tacklers start from stationary, that means it'll take the Enyo 19.5 seconds to cross the 30km -> 10km distance to get into scram range, while it takes the Taranis 10.2 seconds. 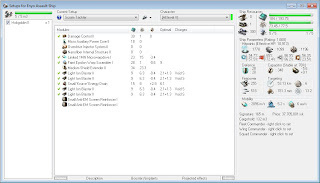 In fact then, the Enyo takes 5257 damage over the course of its approach (48% of its total EHP, putting it into armour), whereas the Taranis only takes 1656 (25%, leaving it about half shields). The Taranis is significantly better at getting into range, but the Enyo's natural HP should make it better at surviving once it's there. Let's test that theory. A flight of warrior IIs does about 80dps under optimal conditions. The Taranis has less of a sig radius advantage once both ships have disabled their MWDs, but still has a considerable speed advantage which helps it evade turret fire at lose range. At a 2km orbit (which is a bit wide really, but this analysis was designed with newbies in mind) the Enyo is going to take an average of about 60dps from the occasional turret hit, while the Taranis would take about 18. Assuming it starts without damage, the Enyo has enough buffer tank to survive this 120 or so incoming dps for 91 seconds. The Taranis only had to take on around 98dps, but its weaker tank will only keep it going for about for 66 seconds. (This ignores natural shield regen, which tips things in the Enyo's favour slightly more). The Enyo's remaining 5656 EHP would last for 47 seconds, whereas the Taranis' 4857 EHP would keep it going for for 49.6. On balance I think the Enyo wins this one, particularly because many fights will not begin with a chase. It's worth bearing in mind that a smart tackler would clear drone damage with their guns rather than sit and tank it, and the Enyo does that better too as we'll see. There's not really any competition here, the Enyo wins hands down with more range and more damage: 255 compared to 206, or about 24% more (loading Null for clearing drones, its 188 vs 158 and the range difference is even more noticeable). However is that damage advantage really a big deal? To put this in a meaningful context, a Warrior II drone has about 800 EHP, so an Enyo will kill a drone in 4.3 seconds in imaginary ideal circumstances, whereas the Taranis would take about 5.1 seconds to do the same. Against a full flight, thats a saving of 4 or 5 seconds for the Enyo. On top of that, the Taranis' shorter range is likely to cause it to miss drones more often. It's not a huge difference (likely to mean the ranis takes a few hundred more damage before the drones are cleared), but it's something. What about using Void against the primary target? Assuming your gang - excluding yourself - does about 2000dps (4 battlecruisers worth, or a pretty small gang), it's the difference between a typical 50k EHP battlecruiser dying in 22.2 seconds (Enyo) and 22.7 seconds (Taranis). Of course that assumes everyone is dealing optimum dps which is silly, but proportionally that gives you an idea of what your damage means to the gang. Tl;dr: If you're more about brawling similar sized ships or flying around in a smaller gang where frigs are your major dps, then I'd definitely go for the Enyo since that's really where it excels. 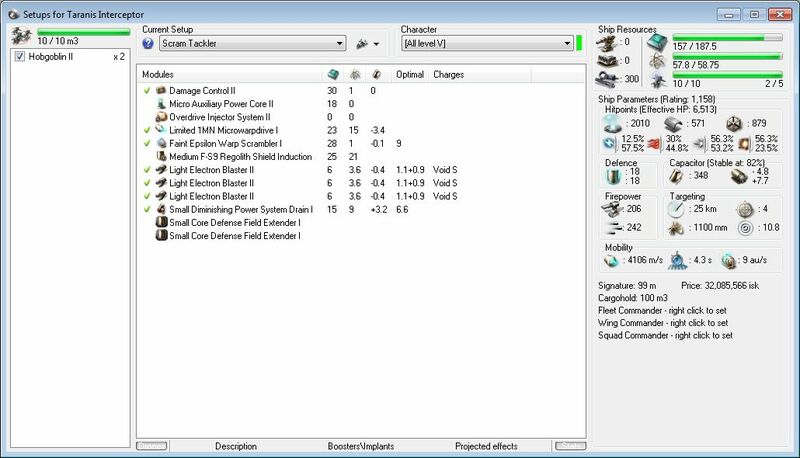 For a tackler though, the Taranis actually looks like it might be the stronger choice, particularly given that most of your losses as a scram tackler will be dying while chasing. - The Ishkur is worse than the Enyo for tackling in pretty much every way - slower, less EHP, more sig, etc. Enyo > Ishkur for tackling. - The Ares is actually better than the Taranis if you don't care about damage output, even as a scram tackler. It's slightly more fragile, but significantly faster and also gets a sweet scram range bonus. - Aside from lower damage (no drones, for a start) the Atron is pretty much as good as the Taranis except that it doesn't have the sig radius bonus. If you're on a budget, love that Atron! Heh, not sure where I got that from. You're right. "Damage output is a nice plus, but not a priority." If true, then why use the Hobs? Wouldn't EW drones do more to tip the scales? Aside from ECM, the EW drones are all pretty terrible due to small percentages and stacking penalties. You could use EW drones if you want, it's up to you - your drone choice doesn't really impact your tacking ability (unlike fitting low slot damage mods), and a damage drone from you is just as effective as one from any other non-bonused ship in the fleet. EW drones do increase your survivability, as a tackler, even if just slightly - every second counts. ECM drones do a great job of making it more difficult for your target to kill you. Web drones can slow down targets who are trying to burn away from you, so you can close range faster. TD drones can reduce the incoming damage from guns, while you are zigzagging in and while you are orbiting. TP drones can help your corpmates hit the target and do more damage faster (the faster the target dies, the more likely you survive). Admittedly, SD drones are useless, though. I've survived, with only that little slice of structure remaining, enough times to know that every little bit helps. And damage drones allow you to clear hostile drones more quickly, which are arguably the greatest threat to you as a tackler once you're within range. With ECM drones I can see the benefit, but mainly just to reduce neuting pressure - the likelihood of them getting a jam before you're already under your target's guns is very low. As for the rest, I'm not convinced they're actally any use in practice. No argument that, with a full flight of drones available, damage drones beat out EW drones almost every time. 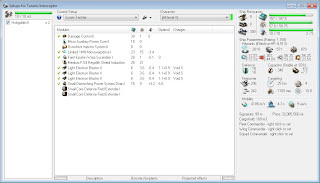 But, with only 2 drones available for the Taranis and 1 drone for the Enyo, is this still true? Also, both of these ships fit small blasters, which are already pretty good at killing drones fast, even without the damage drones. Having fewer drones doesn't really affect your choice *that* much imo. It might impact how much effort you're willing to put into micromanaging them, but it's not like turrets where a ship with poor damage potential gains less from fitting a damage mod or upsizing its guns than one with good damage potential - another hobgoblin/warrior/ec-300 is just as effective whether it's by itself or one of five, or whether it's launched from one of your fleet's damage dealers or one of your tacklers. For the other EW drones having fewer of them at least mitigates the stacking penalty, but their usefulness is limited by other factors. For SW drones, the big problem is speed - a max skilled warrior SW-300 goes 3km/s, the same speed as the Enyo and slower than most other tacklers. 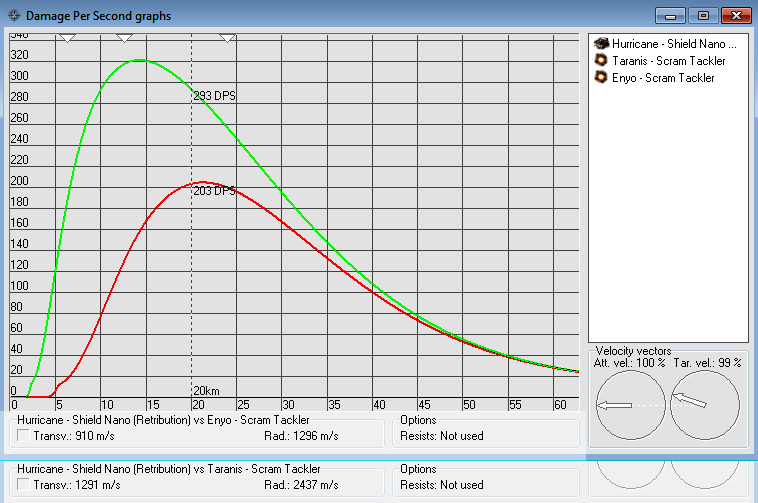 When it gets in range (which might be after you do, and at best will probably be not long before), it only slows the target by a fairly small amount - about 50m/s for your typical BC, which assuming it gets there 10 seconds before you (a generous assumption) is going to save you travelling a whole 500m. Once they're scrammed, we're talking about less than 10m/s difference. For TD, SD and TP drones, their mid slot equivalents work from range so there's no reason that your target shouldn't already have them applied (in which case stacking penalties further reduce the already small effect of your drones). The TD drone is probably the only one that I can see a decent argument for - it's slightly faster than a SW drone (4km/s) and it useful both while approaching and while in orbit. The effect is pretty small (5% range, 5% tracking) but if you used it smartly, and the rest of your gang wasn't using mid slot TD, I could see it making a meaningful difference. Not much, but maybe enough to justify it in the right circumstances. I always thought it was embarrassing to be caught with a scram on an fleet inty. The taranis was probably the only exception. I probably listened to Glepp too much. Now if my only goal was to put a scram on something with an AF (so on a moderately Slow target) I'd use a hawk or a harpy for asb and a tracking disruptor. Additionally it can fit a web to hero those 100mn. Mind you, Hyena or Keres might even be a superior choice. And bonus point for rare ship. Honestly, the Hyena and Keres are pretty terrible for the job due to low HP and massive sig radius. There are good reasons that nobody uses EAFs right now (other than the occasional Kitsune). I wasn't very serious on the eaf. In my defense they have the same ehp as your taranis fit. Sig radius is a problem here of course but they might have the ewar slots to mitigate that somewhat on a 1v1 situation. But this is where eft warrioring becomes dangerous for your health. "Assuming your gang excluding does about 2000dps"
As the person who originally asked the question on the E-Uni forums I'd just like to say thanks again for the effort you put into your response. As I'm a poor Unista I'll be sticking with the Atron for now although I did have some success with an Incursus the other day which is making me lean towards the Enyo at the moment. If you like the Incursus, you'll love the Enyo - guaranteed! How did you calculate the average damage over time for the ships? I get how to use the DPS graphs (I think) but can only read single values off them. Is it using EFT or did you do it manually? I took the single values from the EFT graph at 10, 15, 20, 25 and 30km, and then took an average of them. It's not the most robust science, but it's a decent approximation. An interesting article as ever, Azual. Personally I prefer the Jaguar for this role with a single masb and mse. The damage output is less, but it can tank a flight of unbonused drones and with a energy vamp in the high it can hold scram for very long while. Unistas should check the recorded lessons archive, there was an excellent lesson on assault frigates as heavy tackles a few months ago. It'll be interesting to see peoples feedback when they try it out. Thanks again Azual, thought provoking stuff. I am disappointed in you Azual. The article should have been Taranis v Jaguar. Who uses a SHIELD enyo for 'heavy' scram tackle, and why would you waste time writing an in-depth article from such a shaky premise? It would have been a better comparison, but it wouldn't have answered the question! I'm glad you did *not* compare Taranis vs Jaguar. Not everyone wants to spend time cross-training races, esp. newer players. So, seeing how ships within the same race compare, for a given role, is more generally useful than comparing ships in different races. Esp. since CCP is now pushing to make it even more time consuming to cross-train, with the upcoming changes to dessie and BC skills. Azual - brilliant and thorough analysis, as always, and very useful. You always teach me something new. Thanks for your insightful mind and consistently clear, candid presentation of your findings. Please - keep up this kind of good work for us EVE players! While I can see where you are coming from when comparing Taranis and Enyo, I don't just see what Rynnik writes, but also how the damage part would be pretty irrelevant to me. Sure, if you want to kill a hostile frig, the DPS starts playing a role, but the things you mentioned ("taking damage while you approach") usually don't have you in a damage dealer role. Thus the Enyo would really be more out of the question (as it deserves - noone uses an Enyo for scram tackle, stated above). While I can totally see how making a comparison is a good way to deduce "See, that's why one wouldn't want an Enyo as a scram tackle" (unless as a damage dealer, but than you probably wouldn't call it tackle), IMO it should still contain a stronger note at the end that the Taranis or Enyo might not be the top candidates for the comparison (the Enyo not for sure), but that there's other strong contenders (it's hinted at with the Ares, but the Jag mentioned before would still be my fav as well). Like I said, it's not the most scientific analysis. I'm actually thinking of doing a version based on the 'top' ships in each class (dram v jag v stiletto etc) to see whether it would look any different. Great article, as usual, Azual. I always find it amusing when someone says that Ship X is *not* a tackler. Given how many ships are regularly fit with the holy trio of scram/web/mwd, you'd think that almost every ship in the game was a tackler. I believe that the best tackler is situational. For example, an Enyo is almost always a better tackler than a Taranis, when you warp in right on the target. This is such a great article and I hope we see more on this kind of comparison. 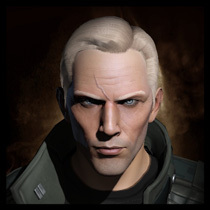 On the subject of cross training, it makes good sense for most gallente pilots to cross train to minmatar for the pirate faction frigates and cruisers. Racial frigate V and tech 2 small guns for the other race isn't a significantly long train so I don't find it outrageous that the Jaguar has been suggested. I'd like to see a range of "best ship for the role" comparison articles with this sort of analysis coupled with in game testing to see if the analysis holds true in practice.